This aioli is feather light. Aquafaba (the liquid from a tin of chickpeas) makes a spectacular mayo without the risk of salmonella from raw eggs. You will not know the difference. 1. For the aioli, add all ingredients to the jug of a blender, cover and whizz to combine. It will thicken and take on a creamy appearance in about 10 seconds. Store in the fridge until ready to use. 2. For the tabbouleh, add the cauliflower, a few pieces at a time, to a blender or food processor and briefly pulse into a grain-like texture. Transfer the blitzed cauliflower to a bowl as you go, so as not to overcrowd the processor. 3. 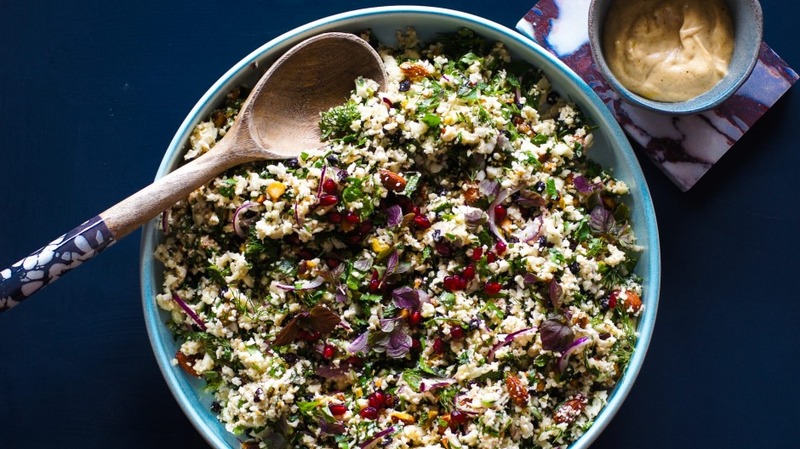 Add the remaining tabbouleh ingredients to the cauliflower, except for the pomegranate arils. Add two to three tablespoons of the aioli and stir through. Season generously then turn out into a serving bowl, scatter over pomegranate arils and serve with the remaining aioli.